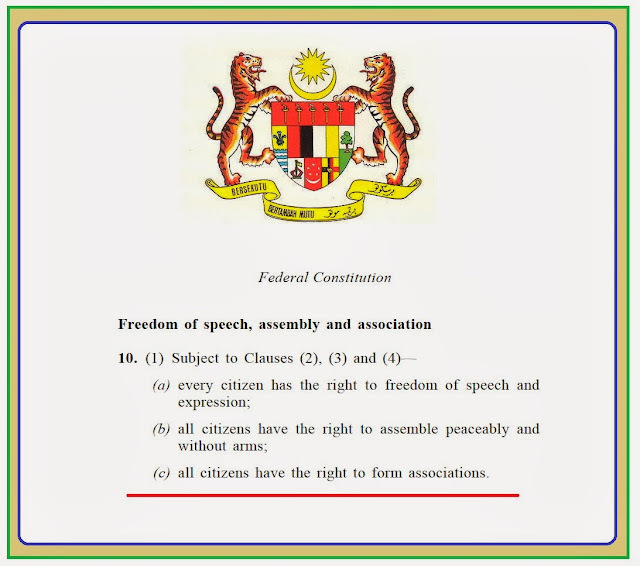 Article 10 of the Federal Constitution guarantees the rights of every citizen to freedom of speech, expression, assembly and to form association. The Government of Malaysia is entrusted with the responsibilities to ensure that these fundamental rights are in no way compromised. Workers, including those in the public sector, are human beings, and have the right and freedom to actively participate in political, socio-economic and cultural life of the nation. All workers have the right to freedom of expression, opinion and to participate in peaceful assembly. Workers also have the right to call on and lobby the government, including the Prime Minister, Ministers, Parliamentarians, State Assemblypersons, political parties and politicians. Alternatively, workers also have the right to seek the assistances from potential candidates who may be elected as peoples’ representatives, corporations and others stakeholders to highlight the injustices and wrongdoings, as well as in campaigning for better workers’ rights including matters that will facilitate better working conditions, safety and other rights. Employers must never make the exercise of these fundamental rights by workers turn into employment misconduct or an alleged ‘breach’ of contract, to justify dismissal or penalizing workers. MTUC deplores the action of the DRB Hicom companies in Pekan for terminating employment of about 18 workers. These workers merely took part in an MTUC sanctioned action during their own time for promoting their choice of contesting candidate’s in the then coming General Election in 2013. The same company also terminated a senior employee for approaching the Prime Minister for assistance in resolving the dispute with the company. The above case is not isolated. Over the past years, many trade union leaders and workers have been wrongfully dismissed and/or penalized by their employers for expressing their opinion and highlighting alleged wrongdoings and injustice by employers. Workers have been dismissed and/or disciplinary action taken for reason such as being seen having a discussion with their fellow workers and/or members of union, participating on online closed forum/debates. These activities are recognized, essential and legitimate for trade union activities. It is wrong for employers to use these ‘trade union activities’ as justification for getting rid of worker’s leaders. Even the participation of workers in peaceful assembly in front of government office is used by some employers as a justification for disciplinary actions. Union busting and victimizing workers have escalated over the years. To name a few, workers and Union leaders from Electronic Industry Employees Union Western Region, Peninsular Malaysia (EIEUWR), National Union of Banking Employees (NUBE), National Union of Flight Attendants Malaysia (NUFAM), Railwaymen’s Union of Malaysia (RUM), National Union of Tobacco Industry Workers (NUTIW), Kesatuan Pekerja-pekerja Alam Flora (Alam flora) and the National Union of Transport Equipment & Allied Industries Workers (NUTEAIW) have been adversely affected by employers action for merely carrying out their rights in Trade Union activities. MTUC reiterates that workers’ right to freedom of expression, opinion, peaceful assembly and to form association must always be respected and upheld. Acting according to our conscience for a better Malaysia is a duty and obligation of all of us. 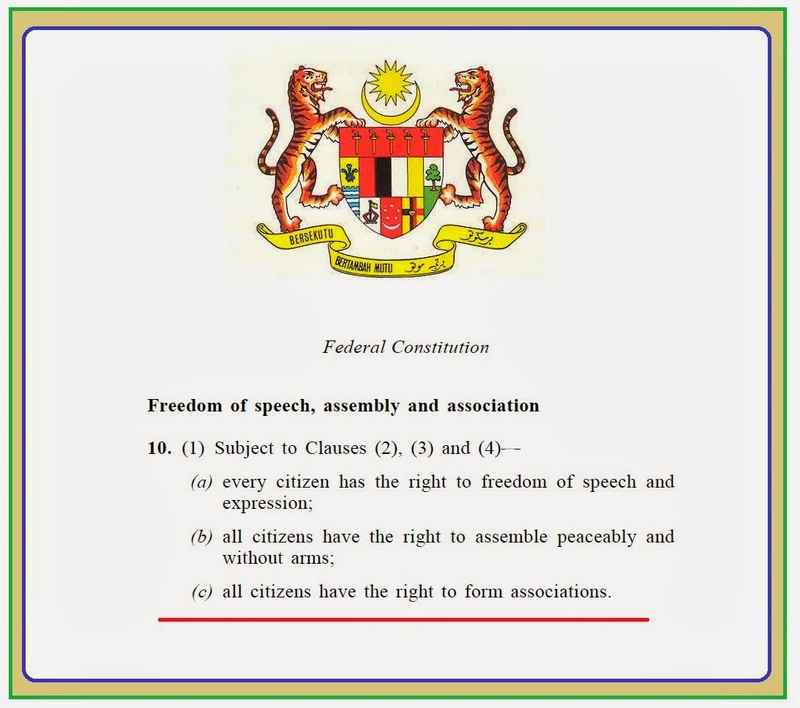 MTUC urges the Government and the police to uphold these basic rights of us. It’s time for Employers too, to respect our fundamental rights, choices and freedom. Any denial and/or hindrances to these rights must be STOPPED.